We have transformed the previously known Yellow Downtown open-top bus route, which explored local museums and heritage sites, into the new Historic City Walking Tour. Guests can now enjoy this incredible offering as a live-guided tour, departing five times a day, for free! That's right, the Historic City Walking Tour operates on a tips-only basis. The Historic City Walking Tour departs daily at 10.30am, 12pm, 1.30pm, 3pm and 4pm from our Long Street ticket office (stop 5), and follows the route on the map above. To join the tour, simply meet our guides at our Long Street ticket office and bus stop on 81 Long Street. The guides are dressed in red branded clothing with their signature red umbrellas. We recommend that guests first enjoy the full tour and soak up the history and stories from the guide and thereafter return to visit the museums and attractions on the route. Did you know we offer two routes on our daily FREE walking tours? 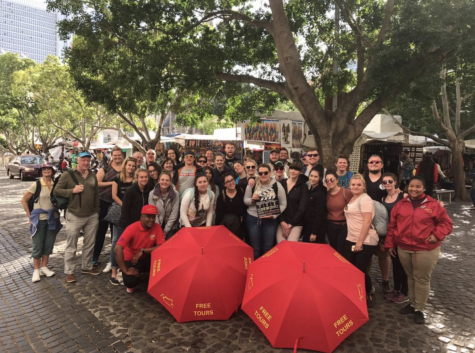 Discover Cape Town’s rich downtown gems with City Sightseeing’s FREE Historic City Walking Tour – with five departure times daily! The Historic City Walking Tour departs daily at 10.30am, 12pm, 1.30pm, 3pm and 4pm from our Long Street ticket office (stop 5). As you explore the city on the 90-minute tour, a guide will highlight historical buildings and places of relevance along the route. Don't forget to explore the beautiful Bo-Kaap with the Vibrant Bo-Kaap Walk, departing daily at 10.30am, 1.30pm and 4pm from the Long Street ticket office (stop 5). Highlights on this 90-minute tour include the Auwal Masjid (the first and oldest mosque in South Africa), the Bo-Kaap Museum and, of course, the famous colourful houses along the route. To join the walking tours, simply meet our guides at our Long Street ticket office and bus stop at 81 Long Street. The guides are dressed in red-branded clothing with their signature red umbrellas.